This article is the first of a three-part series examining Jacques Cousteau’s influence on the development of scuba diving technology, his role in educating the public about the ocean, and his contributions to environmental conservation. Diving has such a long history that its true origins are virtually impossible to trace. What is certain is that ever since the dawn of humanity, men and women have entered the water for numerous reasons, whether it was to hunt, rescue or investigate. As they evolved, humans began searching for ways to prolong their time in the ocean by breathing underwater. While the history of scuba diving has involved countless brilliant minds and adept craftsmen, one man’s contributions stand above the rest. 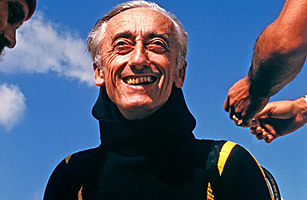 Jacques-Yves Cousteau, the amiable Frenchman known for his endless thirst for exploration, unbridled curiosity and unique story-telling, arguably did more to popularize scuba diving and shepherd its development than any of his predecessors—and many of his successors. Often referred to as the father of scuba diving, Cousteau is a true diving legend. People have been diving for centuries. Ancient peoples engaged in freediving to collect pearl oysters for jewelry, sponges for cleaning, and seafood for nutrition. Given the lack of technology at the time, only rudimentary methods were used to enhance diving abilities, such as holding on to a heavy rock to sink or being tethered to a rope that would haul a diver back to the surface. An ancient Greek legend tells of two divers who escaped from the clutches of the Persian King Xerxes by swimming away in the dark of night, using only a hollow reed as a crude snorkel. They would later return, employing the same strategy to cut the mooring lines of Persian ships while they sat anchored. Diving technology did not begin to develop meaningfully until the dawn of Renaissance in Europe. Characterized by the spread of scientific inquiry, this period led to countless discoveries and inventions. During this time, scholars, tinkerers and inventors started to explore ways to make it possible for humans to breathe underwater. 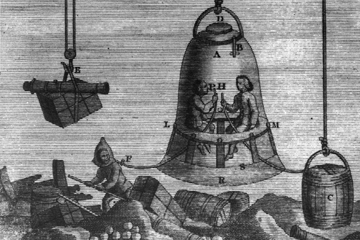 The first underwater device for bringing humans underwater that met with limited success was the diving bell, a chamber used to transport divers which was either fully enclosed or open on the bottom. At first, these devices were terribly inefficient. Early models carried only the amount of air that could fit in the chamber, making bottom times extremely short and the risk of suffocation extremely high. 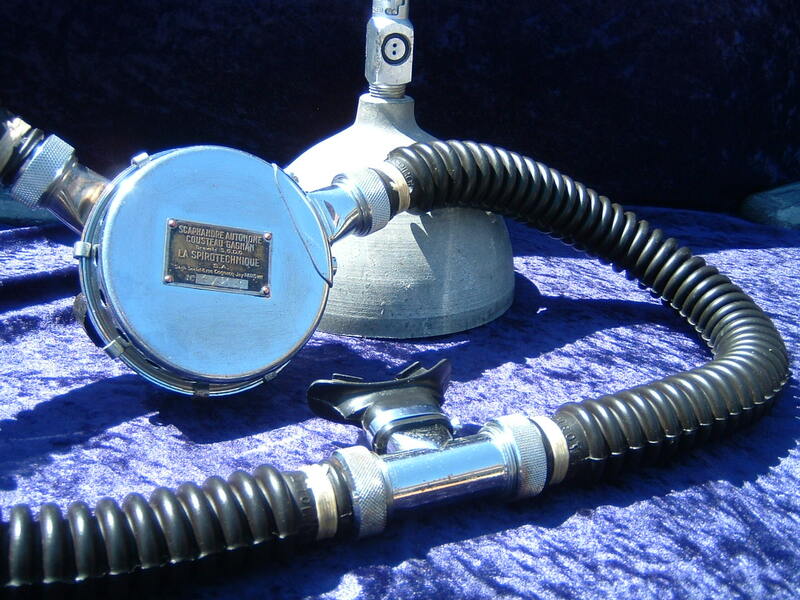 Later versions relied on a system of hoses that transferred air pumped from a bellow at the surface. Finally, English engineer John Smeaton invented a diving bell made from cast iron that incorporated a more efficient hand pump. This model represented the first truly modern diving bell and by the 19th century most major harbors had purchased one for salvage operations. 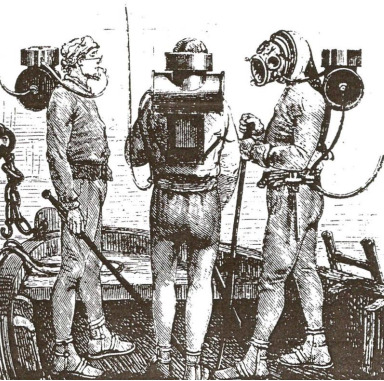 An alternative diving system was the diving dress, the first of which was created by John Deane in 1828. Originally meant to allow firefighters to enter smoke-filled buildings to save people and property, Deane and his brother Charles modified it for an underwater environment. Deane’s Patent Diving Dress consisted of a copper helmet that would cover a diver’s head, attached to a cloth body suit to protect from cold water, and weighted shoes to counteract the positive buoyancy created by the air in the suit. Air would be supplied from the surface using an air pump. The Deane brothers’ design had one major drawback: the helmet was not attached to the suit so it would flood if the diver turned their head at an angle. German-born engineer Augustus Seibe improved on the Deanes’ design by devising a way to connect the helmet to the suit to create a seal. Siebe’s improved design came into widespread use when it was adopted by the British Royal Navy as standard diving equipment. By the early 1900s, commercial diving was well established, using diving bells and diving dresses, which made underwater civil engineering and salvage projects practical. Neither the diving bell or the diving dress would allow divers to explore the ocean unencumbered, as both required a constant supply of air from the surface. Because of these mobility limitations, efforts were made to develop a self-contained underwater breathing apparatus (SCUBA) that would allow divers more freedom. Two types of SCUBA emerged: open-circuit systems where the excess air would be released directly into the water; and closed-circuit systems that would extract excess oxygen that the diver exhales, known today as rebreathers. 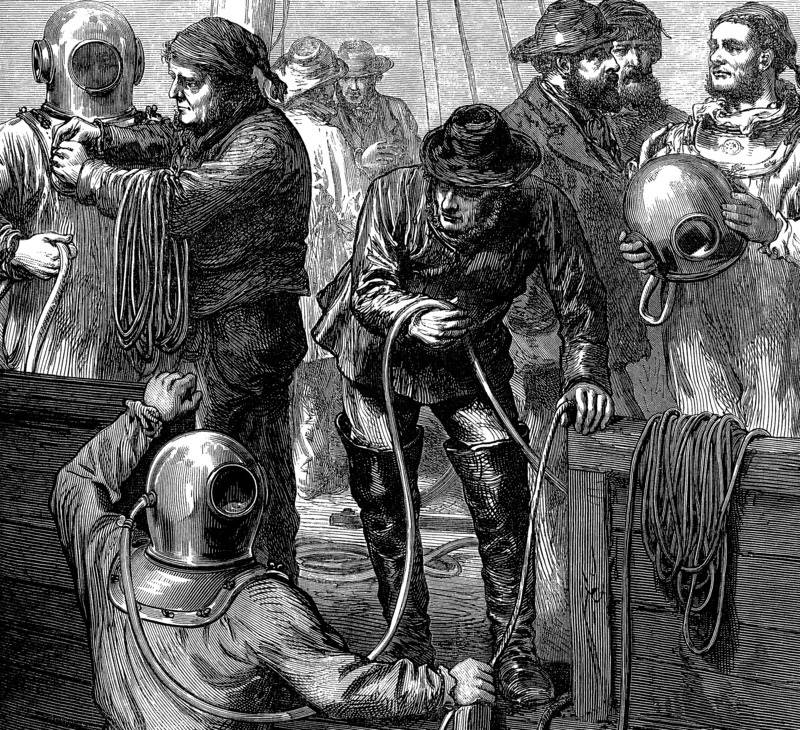 Early attempts in the 1800s to create open-circuit scuba systems suffered from two problems. The first was that compression and storage technology for air had not yet developed far enough, necessitating air to be supplied from the surface. Second, regulator systems that could provide air at the surrounding water pressure in a controlled manner were nonexistent or inefficient. In 1864, French engineers Auguste Denayrouze and Benoit Rouquayrol solved the regulator problem when they invented the demand regulator, which supplied air only when the diver breathed in. However, their system still required air to be supplied from the surface. Yves Le Prieur developed the first truly self-contained open-circuit system in 1925, consisting of a cylinder of compressed air carried on the diver’s back that supplied a constant flow of air that the diver controlled manually. Prieur’s design did not include a demand regulator. Unused air was being dispensed constantly and therefore ran out very quickly, leading to short bottom times. These inventions, while advanced for their time, were much less efficient than the diving equipment in use today. But they sure had come a long way from the diving bell. Jacques-Yves Cousteau first developed a keen interest in the ocean while swimming in the Mediterranean Sea to help recover from a near-fatal car accident that broke both of his arms in the mid-1930s. A friend had lent him a pair of goggles that opened his eyes to the underwater world and he immediately became curious about this unexplored part of the natural world. He started freediving avidly, for sport and hunting. 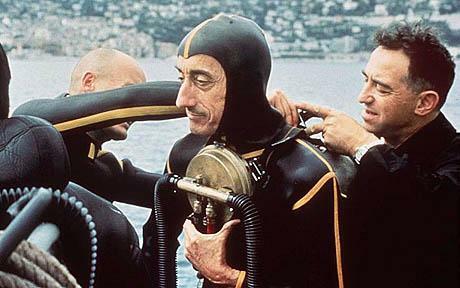 However, Cousteau’s frustration with the limited bottom times allowed by freediving caused him to start experimenting with existing scuba technologies. He tried and abandoned the closed-circuit rebreather devices after suffering convulsions on two occasions, likely caused by oxygen poisoning. He also dismissed the Le Prieur open-circuit scuba set as impractical because the constant flow of air drained cylinders too rapidly. Cousteau set about to solve the two problems that had plagued scuba devices up to that point. He wanted a device that would combine both the compressed-air cylinder and the regulator that would supply air on demand. He teamed up with Emile Gagnan in 1942, an engineer who worked for Air Liquide, a French compressed-gas producer, and asked him to design such a device. By 1943, they had designed and tested a scuba set with a double-hose demand regulator that could be mounted onto air tanks holding up to 200 atmospheres, allowing dive times longer than an hour at significant depths. They called it the Aqua-Lung. In 1946, Cousteau and Gagnan began to mass-produce their invention as the heads of La Spirotechnique, a division of Air Liquide. They began exporting the Aqua-Lung and licensing the patent to foreign manufacturers. The Aqua-Lung quickly achieved commercial success and spawned competition from other companies who imitated the concept. The race to bring scuba diving to the broader public was on. The impact of the Aqua-Lung cannot be overstated. It was the first efficient and safe scuba set that allowed divers to stay underwater for long periods of time at deep depths. It was a small contraption with a simple design that was reliable and relatively inexpensive. This monumental advance in diving technology laid the foundation for the creation and growth of the recreational scuba diving market. Up until that point, diving equipment, though widely used for military and commercial purposes, was not available to the general public for recreational or sport purposes. The very idea of diving for fun, or to explore, was virtually unheard of. Cousteau and Gagnan’s invention spawned a generation of divers with the freedom to explore, and its creation set Cousteau on a lifelong path of underwater exploration and research. Gradually, public perception of scuba diving began to shift from something for a select few wild adventurers to an activity that anyone who wanted to could try. The creation of the Aqua-Lung was only the beginning of Cousteau’s long and varied contributions to scuba diving. Soon after, Cousteau and his crew of underwater explorers set about exploring the depths of the ocean in far-flung places of the world from aboard the Calypso, the former British minesweeper-turned-oceanographic-research-vessel. The Calypso would become Cousteau’s nautical home base for the next several decades; his jumping-off point for expeditions that produced research, books, movies and the television shows that brought the ocean to the living rooms of people throughout the world, opening their eyes to a whole new silent world. Part two of this three-part series will explore Cousteau’s unparalleled contributions to ocean exploration, oceanographic research and conservation. By: Ryan Patrick Jones, Community Editor at Deepblu.